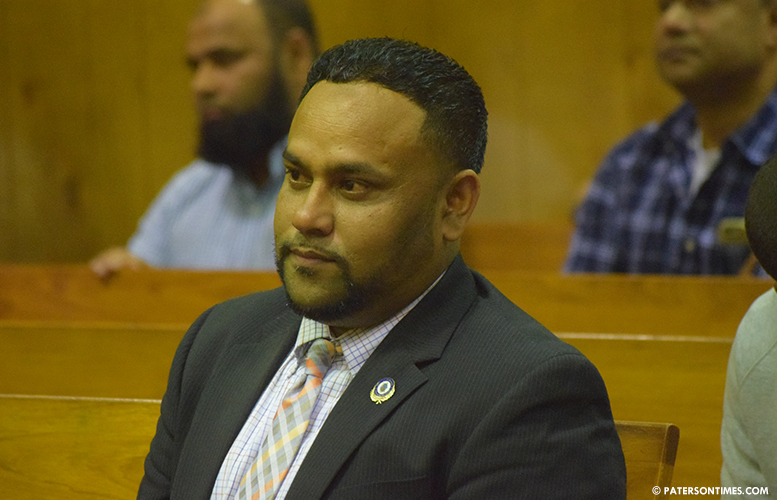 Councilman Shahin Khalique’s previous hometown has issued a warrant for his arrest after he failed to answer a summons issued for a zoning violation, according to court records. Municipal court judge Peter Weiss issued the warrant for Khalique’s arrest on Aug. 22nd, 2017. It authorizes “any police officer” to take Khalique into custody. Khalique, who represents the 2nd Ward of Paterson, did not respond to a call for comment on Monday. Khalique failed to show up to the Wayne Municipal Court to answer a summons that charged him with violating a municipal zoning ordinance that requires a permit to install an above ground pool. Summons issued by a Wayne Township zoning officer states the violation occurred on Jun. 26th, 2017 at a property on Ratzer Road. It’s not clear why Wayne has yet to enforce the warrant. Khalique can be found almost every Tuesday after 7 p.m. at the Paterson City Hall. For example, the city council has a meeting tonight starting at 7 p.m.
Khalique moved from Wayne to Paterson to run for a council seat. He beat former councilman Mohammed Akhtaruzzaman in an election in May 2016. There was widespread voter fraud involving mail-in ballots in that election. Akhtaruzzaman challenged the outcome of that election through a recount and then a court battle. Khalique remained the winner in the race after both the recount and the court battle. Akhtaruzzaman declined to comment on the arrest warrant on Monday afternoon. A notice of the arrest warrant was sent to Khalique’s address on Rossiter Avenue in Paterson. It states the warrant was forwarded to the Wayne Police Department for enforcement. “To avoid embarrassment and inconvenience of your pending arrest it is suggested that you report to the police department for the purpose of posting bail,” states that notice. The warrant remains outstanding, according to court records. it's amazing that this councilman does what he wants not only in Paterson but in other cities.